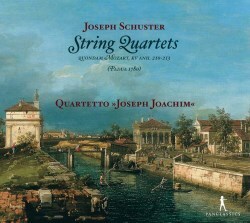 Joseph Schuster is a forgotten name these days; Presto lists only one other work currently available. He was born in Dresden, but his important musical influences seem to have come from Italy, having made a number of trips to Padua, where he was introduced to the music of Tartini. The musical powerbroker there was the Marquis Giuseppe Ximenes, who commissioned these works. Schuster’s patron in Dresden, the Elector’s daughter Maria Antonia, also had a Paduan connection, with her musical advisor being Giovanni Ferrandini, who spent much time in the Italian city. Perhaps the most intriguing aspect of these undoubtedly fine quartets is their connection to Mozart. In 1923, the French scholar Georges de Saint-Foix attributed four of the quartets to Mozart, and until 1964, they were given the catalogue numbers K.Anh. 210-13. The connection between Schuster and Mozart goes even further: Wolfgang complimented Schuster’s music in a letter to Nannerl, and also visited Padua at a similar time to Schuster. However, I think it is more significant in the context of this recording that the works could have been thought to have been composed by Mozart. While few would say that the string quartet is his best genre, this is still Mozart after all. If musicologists were tricked, then it says something about the musical qualities of Schuster’s compositions. My normal practice when auditioning a new recording is to play it in the background while doing something else. If my attention is drawn to the music, that is usually a good sign, and that happened here. Schuster’s talent for a diverting phrase and interesting conversation between the instruments kept grabbing me. Melody may not have been his strong point, but the rhythms and harmonies are quite original. These are not flashy or frilly works, as is often the case in this era; in fact, they are quite restrained, I might even be tempted to say austere. Of the seventeen movements – Quartet 4 has two, the rest three – only one has a tempo marking faster than allegro, and the first quartet has no allegro at all. The recording is not new; it was originally released on the Symphonia label in 2001. The performers use period instruments, but for those “allergic” to this, let me assure you that the sound produced, while quite lean, seems very appropriate for this restrained music. With no point of comparison, my only comment on the performances is that they seem to be in accord with Schuster’s intentions. The microphones have picked up quite a lot of breathing, which is not ideal. The booklet notes are quite awkwardly written (or translated) in unidiomatic English. They are very detailed in their tracing of the Mozart connection to Schuster and these works, but the odd phrasing and excessive wordiness make them difficult to follow.